Preheat oven to 180°C/350°F (convection). Cook spaghetti in salted water according to package instructions. Heat some oil in a frying pan, then fry bacon cubes. Whisk eggs, heavy cream, and a part of the Parmesan cheese. Add fried bacon cubes. Season with salt and pepper. Add cooked spaghetti and mix. Grease the muffin tin. 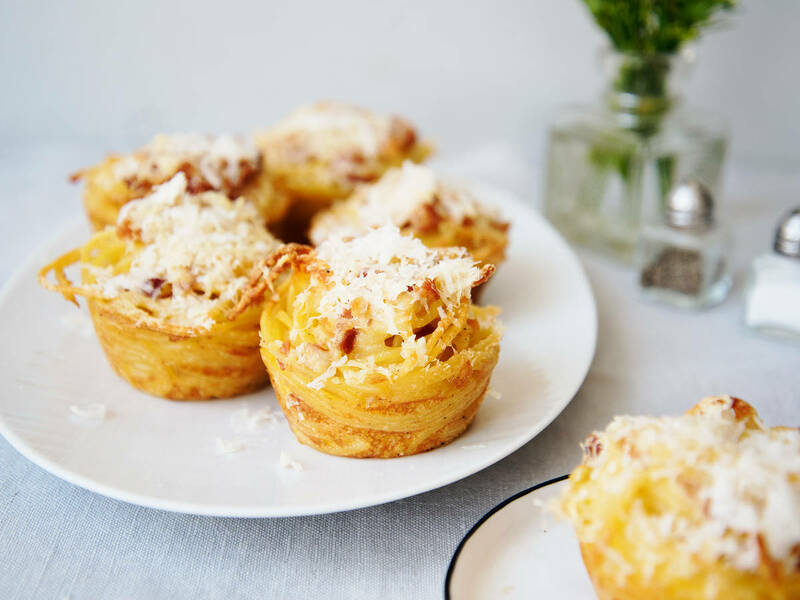 Twirl spaghetti strands around a fork and place into muffin cups. Sprinkle with the remaining Parmesan cheese, then bake at 180°C/350°F (convection) for approx. 15 – 20 min.